What To Do With Those Old Payphones? Not my photo, but nice too! So I found myself in Suffield yesterday. Now if there is one thing that you should know about Western Mass it is this - if you ever find yourself off the beaten path there is some beautiful driving around here. Farms, pastures and Victorian and colonial houses abound. It was on that lovely drive down that way that I said to myself - you know this would be a great day to stop into the library here and visit for a blog. It has been far too long. The Sun was out. That muggy Summer air was being pushed out by a cool front rolling down from Canada. Yes it was hot, but the shade and shelter of a friendly setting would be nice. So after I completed what I had to do I swung back that way. Now I know what you are thinking. Eric, isn't Suffield in Connecticut and thus not a part of your original blog mission? Yes, you are correct. It is in Connecticut, but it used to be a part of Massachusetts - Western Mass to be precise. So the former Southfield which at one point (aside from the Cape) was the southernmost point in Massachusetts (at least to the Sprinfieldians, thus its name). 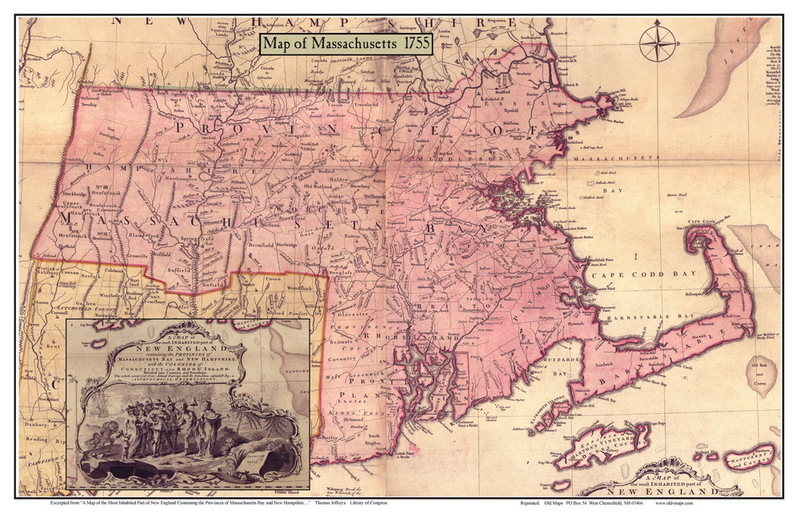 In my ultimate wisdom I have granted it an honorary status and once again claim that land for Massachusetts. Looking back, Connecticut did have a point why not just run the damn line straight across. Mass still had Maine at this point, so yeah taking advantage of a surveyor's error really was a land grab. "Voted that Lewt Aseph Leavitt Be Joyned as an agent with Capt Lyman to Prosecute the affair of Geeting of to Connecticut; who are joyntly & severly Impowered to make application to ye General Court at Connecticut to Receive us under their Jurisdtion and Protect us, and to mack application to ye Great and General Court of this Provinc to Be Relesed from thair Judisdiction, and with ye agents of Woodstock, Somers, & Enfield, to Do any thing Necessary to Prepair the Case for a tryall att ye Court att Greate Brittain, if we cant obtain our Right without, and to be at our Preportionable parte of ye Cost with sd Towns acording to the Respective List of each Town, allowing the major Parte of the agents upon good advice shall govern the affair." It was fun reading because the name family name Kent came up often and lo' I went to The Kent Memorial Library. Which is a very nice library - a good town-sized library. Modern by architectural standards. Parking was great! There's a small grocery store and plaza out behind it. 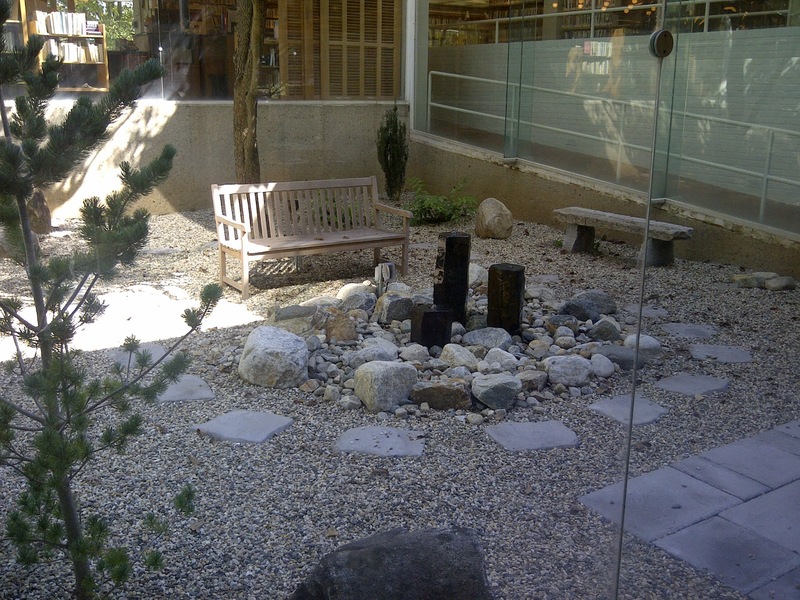 A little Zen with your read? When I walked into the building it screamed 70's and I was right. Those buildings always evoke a strange feeling in me for some reason. The present building was constructed in 1972 after the original building erected in 1899 outgrew its confines. 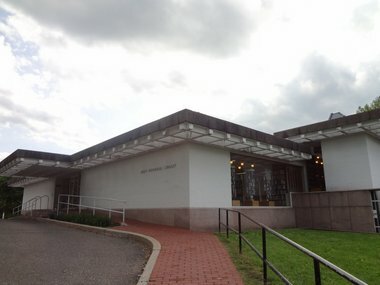 The original building was purchased by the Suffield Academy and the library moved across the street. They recently had an upgrade just last year which I read on their Facebook page. It is very open to the outside with much by ways of atria and glass walls. So that sunny day really gave the building an uplifting feeling.What I truly loved about this building is that it had a glass-enclosed, open-sky rock garden reading area in the middle of the library - very clever and a nice touch. There was a small art gallery downstairs which I poked around a bit, but it looked closed so I didn't want to pry. I looks as if they hold small public meetings, readings, meet the author type deals in there. A stately grandfather stood across from the counter. 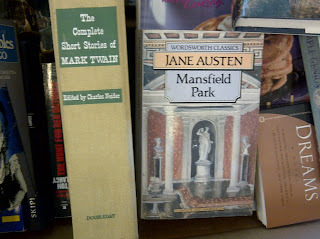 They also have a bust of Mark Twain, but unfortunately it is at the town clerk's office for the time being - Sad panda. The staff there was very cordial to talk to as I found out. There were some boxes of books at the door so quite naturally I poked in and took a look. I had seen some signs on the Green advertising a book sale. I thought that those were for sale. But alas, they were not ready to be sold as was explained to me. 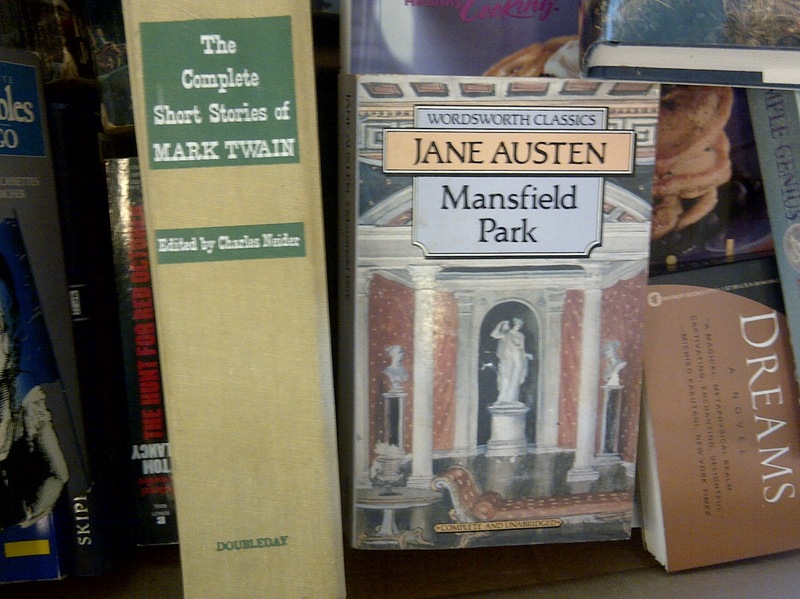 They were taking book donations there for the major 'on the town Green' book fair that they do every year. Hmmm... interesting. It is the weekend after labor day. So mark that on your calendars. She saved my book to be priced when they were ready. She also ran off to find a flier for me after my request. It is easy to get to being right on Rt. 75 which is picked up easily enough in Agawam. I had a great little visit there. I look forward to going back later next week to get my book. In these days of cell phones and superior forms of communication the old public payphone is a dinosaur. They stand there like portals into a bygone phone phreaking era. Ripped from their former places of glory they are disappearing one by one. Today while meandering through cyberspace I happened upon a photo which looked familiar. 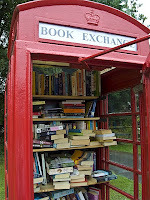 It was the photo of a phone booth converted into a little impromptu lending library. Now I have been meaning to blog on this cute little topic because I had seen this reported as happening in England. 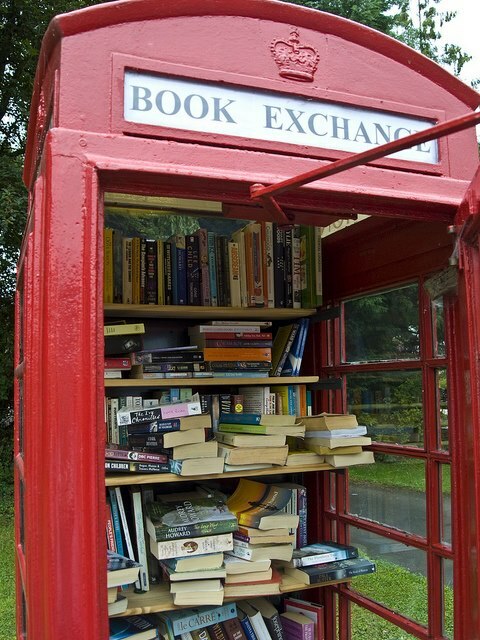 Towns were converting these old phone booths into libraries. They were buying the government owned phone boxes for a discounted price and doing something very good with them. 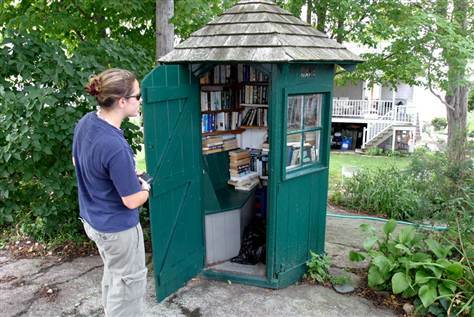 Not all were converted into libraries, but others were turned to other uses like showing off art, wifi hotspots, etc. Now I thought that this fad had started in England, but that may not be the case. 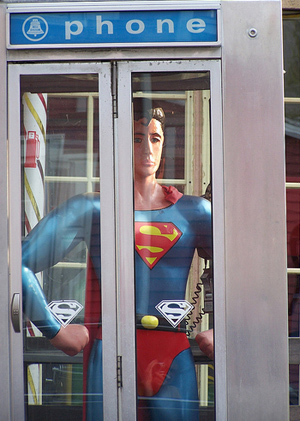 The article I read detailing the English phone booth conversion was dated roughly three years ago. However, while I was poking around this morning I found a news article dated five years ago in Connecticut. (Note - that booth is now on the list of places that I am going to visit.) I really am curious to know where this fad started. I love digging into this type of pop-cultural history. I don't know if the people who have been doing this in Britain got the idea from the article about CT. I'll have to look into this. I can't really see these events spawning independently of each other. It is just so in the niche. Obviously, I will start by trying to contact whoever converted the phone booth in CT since that is the earlier conversion. One of the English phone kiosks. In researching this article I've found that an individual in New York is spearheading an effort to do something similar in New York. He is installing shelves around still operating phones to do provide a take a book leave a book option. As long as property isn't being damaged I have no issue with. Yet, in NYC I don't see how sustainable this effort is going to be. Its not that I have no faith in New Yorkers, it is just that I have no faith in New Yorkers. The conversions I have discovered have been in rural / suburban settings. There is also the phenomena of the Little Free Libraries. Again something similar, but not quite the same. There are quite a few of those little guys all over the place. A few of which are probably in a neighborhood near you. There are three right here in Western Mass. This is a blog for another day. 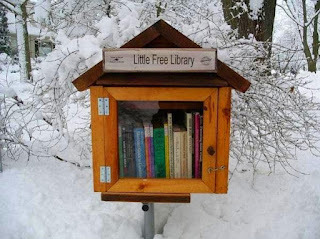 Overall, this is an awesome idea. This is what I mean by pushing for library support in a positive manner. This shows the community that people need libraries without ticking them off by hiking their trash fee and things like that. I love this idea. It shows actual community support. It shows the community how fun library support can be. Plus, it is just a great to have for a community landmark and adds little spice to local life. I want one! Adding a little warmth on a snowy day!